DEAR READERS: It's that most wonderful time of the year again. And following a tradition started by the late advice columnist Ann Landers in 1956 to republish an updated version of her Christmas column each year, it is with great pleasure that I present the 2009 edition of my annual holiday article, "The Pagan Roots of Christmas." Holiday Publishing Schedule: There will be no Thursday editions of The 'Skeeter Bites Report until January 7. Next Monday, December 28, I will present my third annual 'Skeeter Bites Awards -- "dishonors," in the tradition of the Razzie Awards to the worst films of the year -- to the people who in the past year have done more to bring misery to the lives of millions than anyone else. Enjoy this week's article -- and may your holidays be filled with joy, peace and love. 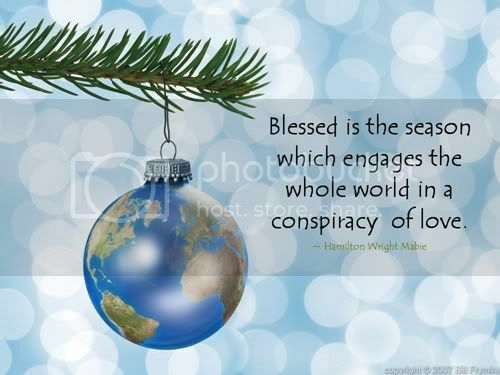 Blessed Be and Happy Holidays. But in 2009, on what ought to be the most festive time of the year -- even in the face of the toughest economic climate in nearly 30 years -- "goodwill to all" again appears to be in short supply in America among certain people, who continue to rail against what they perceive as a so-called "War on Christmas" because of what appears to be a lessening in recent years of the Christian symbolism of the holiday. Once again, Americans appear locked in a conflict pitting Christian conservatives determined to preserve what they say are the use of Christmas symbols and traditions against secularists who argue that for government agencies to do so is a violation of the constitutional ban on government endorsement of any particular religion -- in this case, Christianity. And once again, the battle was being waged in the halls of Congress. Representative Henry Brown (R-South Carolina) earlier this month introduced a resolution calling on his House colleagues to express support for the use of Christmas trees, wreaths and other symbols of the holiday and to oppose any attempt to ban them. "Each year, I could see a diminishing value of the spiritual part of Christmas," Brown said in an interview with CNN. "It would seem like another group would go from the Christmas spirit to the holiday spirit. What I'm afraid of -- if we don't bring some kind of closure to this continuous change, then in 20 years it will almost be completely different from what we see today ... and so we would lose the whole emphasis of what the very early beginnings of Christmas was all about." To date, Brown's resolution has 73 co-sponsors -- all but one of them Republicans. The House has adopted similar resolutions in years past when it was controlled by Republicans, but with the Democrats now in charge, the lawmakers this year departed Washington for their holiday recess without taking it up. And as far as the Reverend Barry Lynn is concerned, that's a good thing. Lynn, executive director of Americans United for Separation of Church and State, said the resolution reflects "this bizarre view by some members of Congress that there is a war on Christmas and that they have to be the generals in some responding army." Lynn told CNN that he doesn't have a problem with members of Congress promoting religion privately as individuals, but that they shouldn't violate the First Amendment's Establishment of Religion Clause by acting in their official capacity on Capitol Hill "trying to 'help' the baby Jesus by passing a resolution on his behalf. It is arrogant and ridiculous at the same time." He lamented that some people feel a "false sense of some kind of attack on Christmas" if a school holds a winter concert instead of a Christmas concert, or if retailers declare "Happy Holidays" instead of "Merry Christmas." Tell that to Bill O'Reilly. The acerbic Fox News Channel talk-show host has been raising hell about a so-called "War on Christmas" for more than five years. "All over the country, Christmas is taking flak," O'Reilly said in a Christmas Eve 2004 broadcast of his "O'Reilly Factor" program. "In Denver . . . no religious floats were permitted in the holiday parade there. In New York City, Mayor [Michael] Bloomberg unveiled the "holiday tree," and no Christian Christmas symbols are allowed in the public schools. Federated Department Stores -- that's Macy's -- have done away with the Christmas greeting "Merry Christmas." O'Reilly goes on: "Now most people, of course, love Christmas and want to keep its traditions, but the secular movement has influence in the media, among some judges and politicians. Americans will lose their country if they don't begin to take action. Any assault on Judeo-Christian philosophy should be fought." Baloney. There is no such assault going on. On the contrary, what is happening is a growing recognition of America's religious and spiritual diversity. The thought has apparently never occurred to O'Reilly and other Christian conservatives that there are literally millions of Americans who are not Christian and have December holidays of their own. Why should Hanukkah or Kwanzaa or Yule not get the recognition they richly deserve? Why should those holidays be ignored or subsumed under Christmas? And contrary to what O'Reilly and other Christian conservatives say, Christmas is not a strictly Christian religious holiday in the first place. It's celebrated by billions of non-Christians around the world and is a public holiday even in countries where Christians are a small minority. Christmas has never been -- and will never be -- a Christian-only celebration and the time has come for Christian conservatives to stop denying the holiday's true origins, for it didn't start with the birth of Jesus in a Bethlehem stable. The truth is, the holiday the world celebrates each year on the 25th of December pre-dates the birth of Jesus by tens of thousands of years. Indeed, it is the most ancient holiday on the planet. Yule -- which this year is today (Monday) -- celebrates the beginning of the sun's light and warmth returning to the northern hemisphere after reaching its southernmost point on the Earth at the Tropic of Capricorn on the winter solstice. It is one of the two very ancient Pagan holidays that are still widely celebrated in the Western world -- and beyond -- relatively intact. The other is our modern celebration of Halloween. This is why Easter (whose name in English is a derivative of Eostre) always falls on the first Sunday following the first full moon after the spring equinox. And why Rosh Hashanah, the Jewish New Year, almost always falls near the autumn equinox. Only a tiny fraction of Americans call themselves atheist or agnostic, the new ARIS survey found. But based on stated beliefs, 1.62 million, or 2.3 percent, are atheist (believe there is no God) and 1.98 million, or 4.3 percent, are agnostic (unsure if God exists or not). The 2001 ARIS survey counted only 53,000 Americans as identifying themselves as "secular" and even fewer -- 43,000 -- calling themselves "humanists." There was no accounting of either group in 1991 and they were dropped from the 2009 survey as statistically insignificant. The truth is, America in the closing days of 2009 is more religiously and spiritually diverse now than it's ever been before in its more-than-233-year history -- and conservative Christian majoritarians are going to have to deal with it, whether they like it or not. <Pagan Christmas: The Plants, Spirits, and Rituals at the Origins of Yuletide by Christian Rätsch and Claudia Müller-Ebeling (Paperback - November 4, 2006). Love the article, I've been talking about this for years. Although I learned a few things in your article, thanks!